Download full-size JPEG (252K) or GIF (227K) image. The 17th-century Dutch astronomer Huygens discovered one of the moons of Saturn through a telescope that he built himself. His observations led him to theorize that the planet Saturn was surrounded by a ring, then only dimly visible through the telescopes of the period. 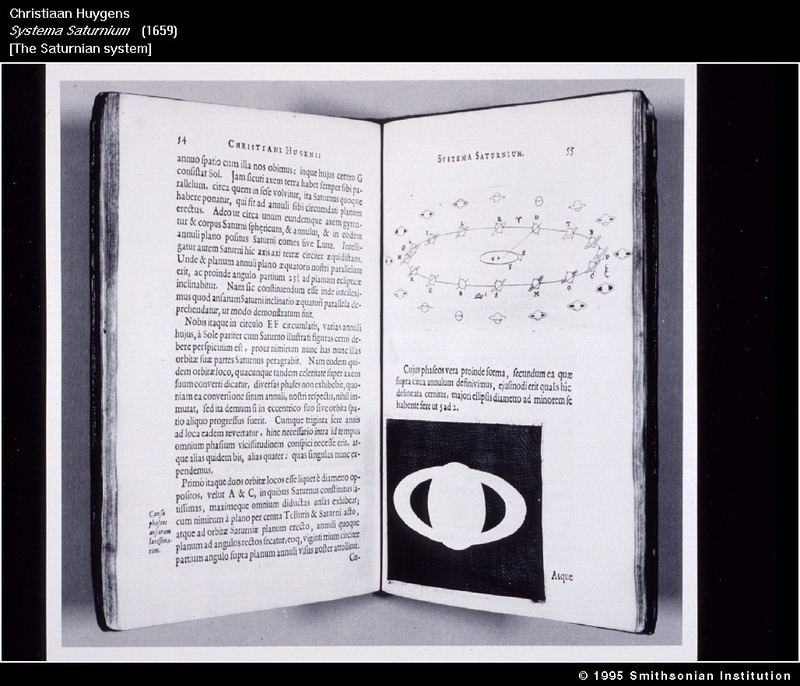 Huygens' illustration shows the ring that encircles the planet. Download full-size JPEG (231K) or GIF (134K) image. Timothy Ely compares Huygens' exploration of outer space to his own efforts at probing "inner space"--the depths of his fertile imagination. Within the reaches of this internal universe, Ely finds the visions that he translates into paintings for his books. To add an extraterrestrial element to his work, the artist has mixed particles of metal oxide into the cover materials. These came from the dust of a meteor found in Argentina in 1576. Download full-size JPEG (301K) or GIF (169K) image. 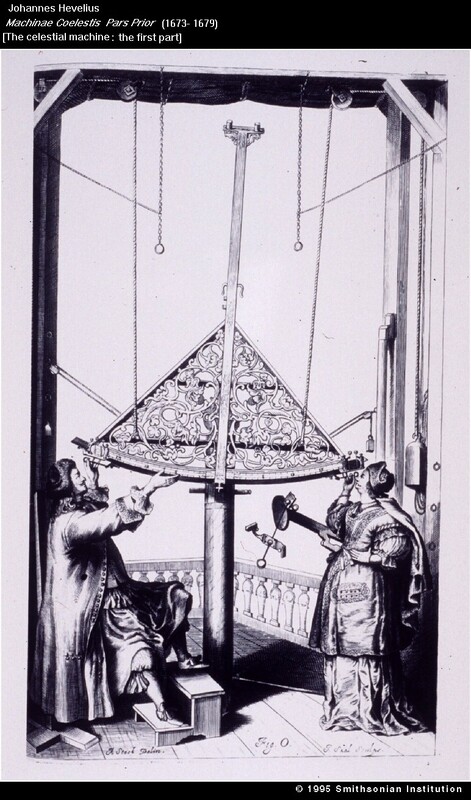 Hevelius, an expert builder of his own "celestial machines," constructed telescopes ranging in size up to 50 meters (150 feet) in length. Yet for charting the position of stars and planets, he trusted more in his own eyesight than in the accuracy of telescopes. Download full-size JPEG (127K) or GIF (95K) image. Artist David Horton is fascinated by Hevelius' early telescope. He comments, "While the mammoth astronomical telescope was a scientific tool, it also could be thought of as a totem to the heavens and a vehicle for imaginary travel." Download full-size JPEG (207K) or GIF (145K) image. 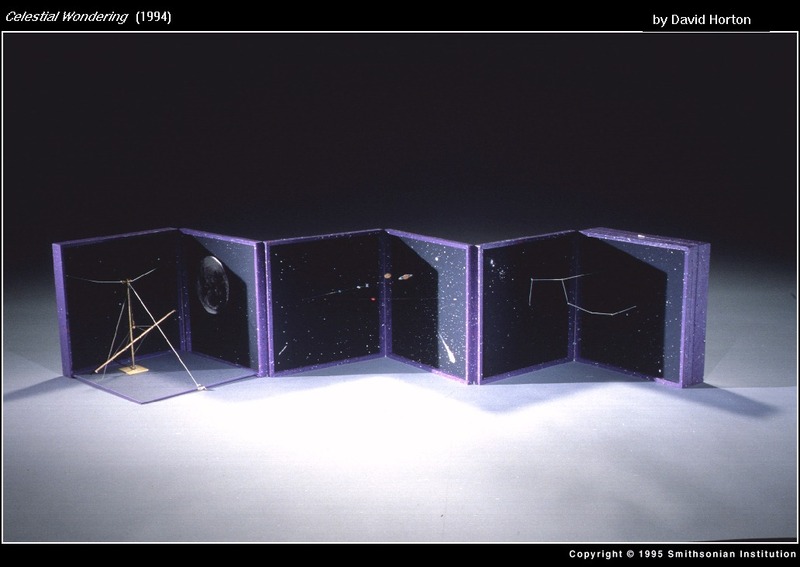 In the late 1500s, the Danish astronomer Tycho Brahe suggested a new model for the universe, in which the Sun circled the Earth while the other planets circled the Sun. Brahe's careful observations eventually helped to confirm the theory that the Earth revolved around the Sun. 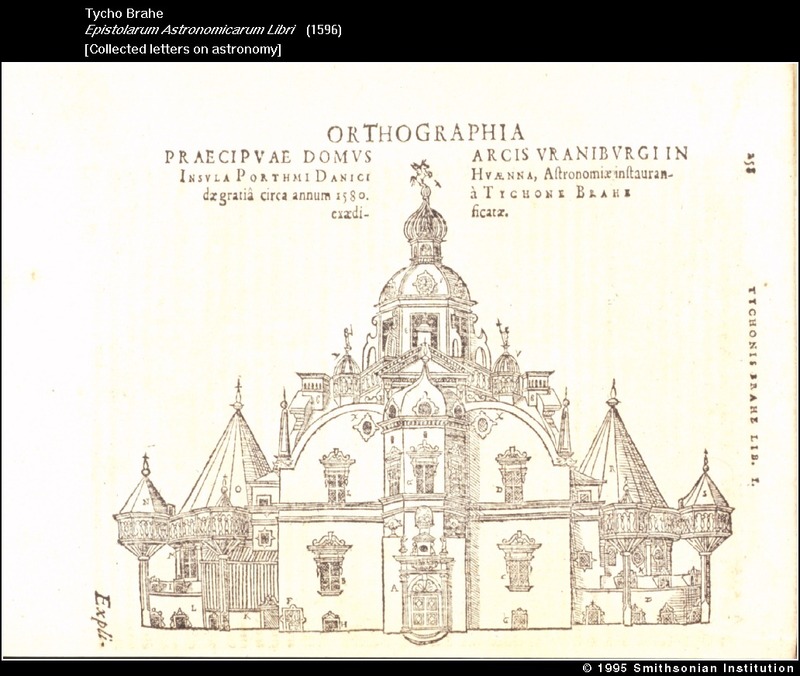 Shown here is Brahe's famous astronomical observatory and home, Uraniborg ["Heavenly Castle"], located on an island off the coast of Denmark. Download full-size JPEG (227K) or GIF (133K) image. 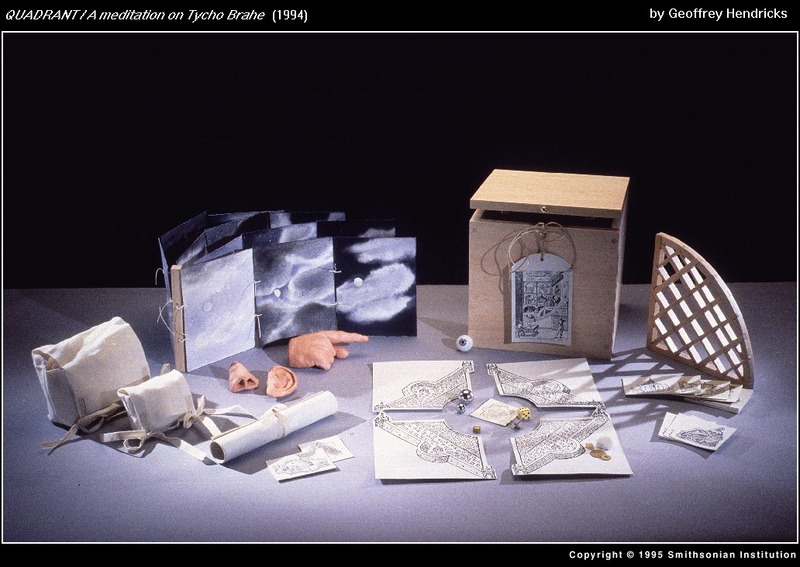 Geoffrey Hendricks' book is like a game with puzzle pieces. Its elements invite the viewer to contemplate the sky and the workings of the universe as Brahe did, and to reflect on the way our senses perceive the world. Hendricks' interest in Tycho Brahe is heightened by his own Scandinavian ancestry. Download full-size JPEG (526K) or GIF (190K) image. Recorde's textbook is written as a dialogue between teacher and student. 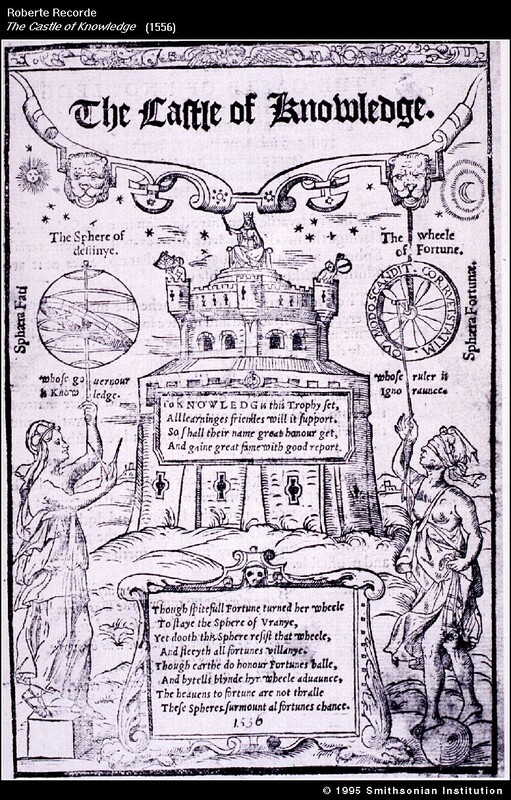 This technique enables the reader to proceed step by step through the basic principles of the ancient system of astronomy, in which the Sun and planets were thought to revolve around the Earth. Recorde is known as the founder of the English school of mathematical writers. Download full-size JPEG (218K) or GIF (143K) image. Katherine Ng employs the dialogue format used by Recorde but reverses the roles of the speakers. In her book, the child is the "teacher" who analyzes the stars, and the adult is the "student." 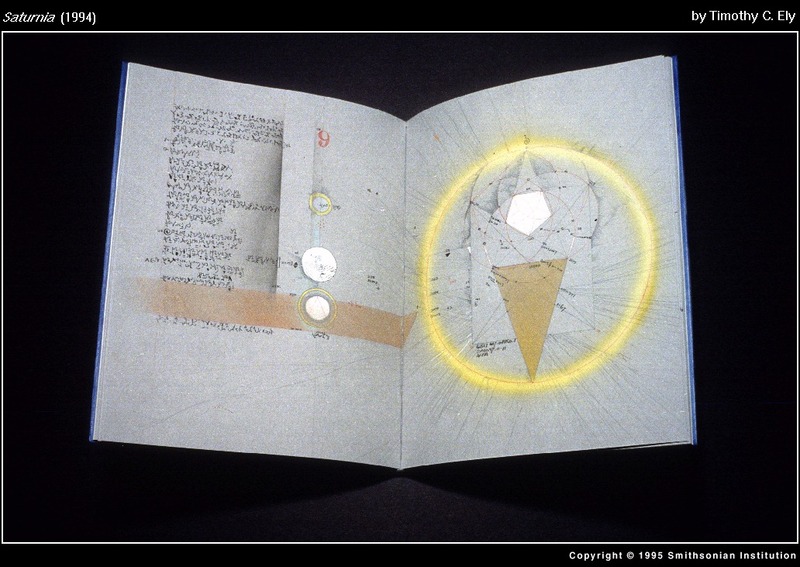 The book itself takes the form of a nearly-completed "wishing star." 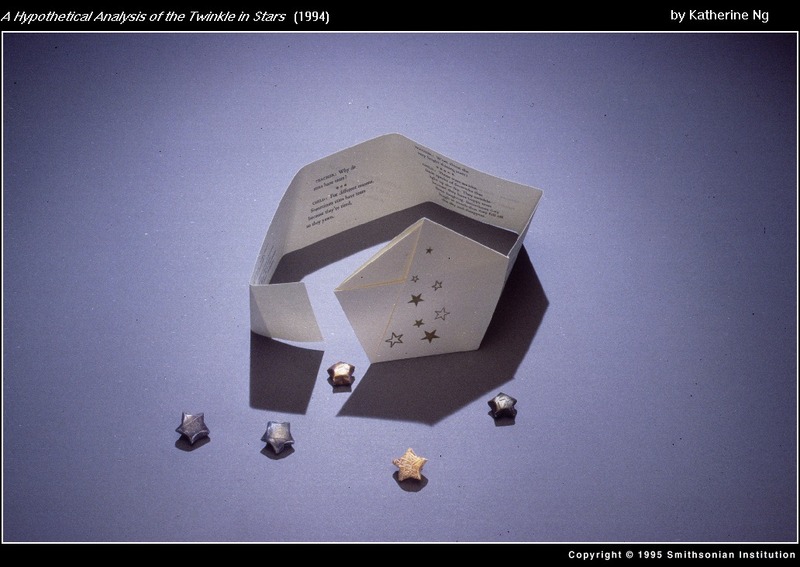 Gentle pressure on each side of the folded paper pentagon would produce a three-dimensional five-pointed star.